Something that comes up frequently in planetary imaging is the question of determining the effective focal length of the telescope. This is a non trivial exercise as there is normally at least one barlow element in the optical train, and the actual amount of magnification provided will depend on the specific optical setup - most barlows will either increase or decrease from their nominal power as the camera is moved closer or further away from the top optical element. For example, the TeleVue 5x powermate will increase its power by 1x for every 35mm of extra distance introduced between the top of the powermate barrel and the focal plane of the camera. (reference: Televue Powermates). In practice, this and other variables in the optical system make it very difficult to accurately calculate the effective focal length of the instrument. F will be the focal length as calculated from this formula, in mm. 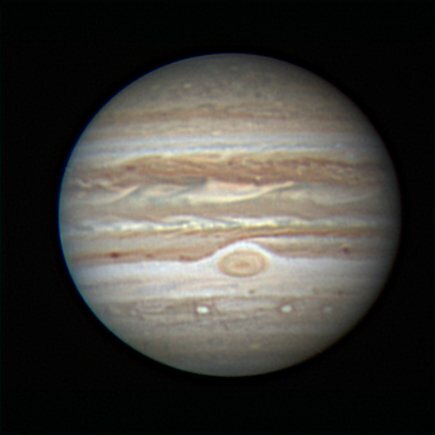 Here is an image of Jupiter taken on the 27th of March 2007, lets work out the focal length of my telescope using it as a practical example. The diameter of my primary mirror is 331mm, so this means I was using a focal ratio of 13149/331 = f/39.7. So there you go, no more head scratching required to work out what focal length was in use in your planetary images.